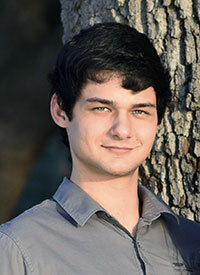 Christopher Car is a 4th year undergraduate student pursuing a B.S. in Physics and a B.A. in Mathematics at the University of South Florida. For the last year, he has served faithfully as the Vice-President of his university’s SPS chapter and has recently been elected chapter President. As VP, Chris has helped his SPS chapter host 5 physics and astronomy research professor talks, organize several outreach events to motivate middle and high school students to pursue a career in the physical sciences, and arrange over a half-dozen fundraisers including campus-wide sales of liquid nitrogen ice-cream. Last Spring semester, Chris was the Lead Traveler in charge of a group 8 physics students from USF, where he arranged for their full funding to attend the week-long 2018 APS March Meeting in Los Angeles, California. Outside of his SPS involvement and academic curriculum, Chris does research designing optical chiral meta-materials in the low GHz range under the guidance of Professor Shi of Photon Lab in USF’s Physics Department. In the past, he has served as VP of his university’s POWUR (Physics Organization for Women and the Underrepresented) chapter and was Treasurer of the Math Club. Chris is currently employed within his university’s Physics and Math departments where he grades papers, leads problem-solving sessions, and mentors lower-level students. He also works part-time consulting for an engineering company writing MATLAB code. Chris’s passion for spreading knowledge amongst his peers and motivating success is trumped only by his own pleasure in learning new ideas and finding things out.